Starter MINI-BLOCKS™ can sit in a tray (flat) without support for easy starting of seeds and cuttings. They are individually wrapped to minimize algae growth. For best results put them on the flat side of the GRO-SMART Tray™ to ensure good airflow around the cubes. 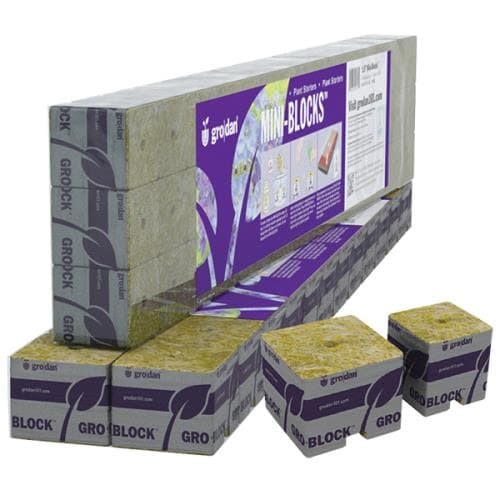 Remove wrapping and transplant into any loose media such as GROW-CUBES™ or GROW-CHUNKS™, or leave wrapping on and set on top of a larger GRO-BLOCK™. These cubes are popular for production of aquatic plants. The advantage MINI-BLOCKS have over A-Ok Starter Plugs™ and MACROPLUGS™ is that MINI-BLOCKS can sit in a tray without support. Mini-Blocks™ sit in a tray (flat) without support for easy starting of seeds and cuttings. These Mini-Blocks™ are individually wrapped in white plastic to minimize algae growth. Remove wrapping and transplant into any loose media such as Grow-Cubes™ or coconut fiber or leave wrapping on and set on top of a larger Gro-block™. Packed in easy tear away strips, labeled with instructions.